Given the many centuries of development, the hundreds of varieties of tea, the different cultures in which it is drunk, and the subtle and elegant input of the Asian traditions, it is no surprise that the simple act of making tea can appear intimidatingly complex. 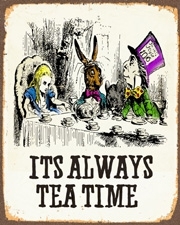 I was brought up in the British tea style. This required tea to be made with freshly-drawn water brought to boiling point, poured onto loose-leaf black tea in a pre-warmed teapot (so that the temperature did not drop), brewed for at least five minutes (often with a tea cosy - a woollen jacket - over the teapot) and drunk with milk. This method is suitable for the most robust kinds of black tea, and the high water temperature and long brewing ensures the extraction of the maximum quantities of antioxidants which do not appear to be negatively affected by the addition of milk. More fragrant, delicate teas, however, especially white, green and oolong, benefit from lower water temperatures (70 degrees upwards depending on the tea) and shorter brewing times, and this is where the subject can become quite complex. It may be helpful to distinguish between utilitarian tea drinking and more cultivated tea drinking. If you drink tea all day long you are unlikely to have the time or inclination to go for more complex methods. In this case - like the majority of Chinese people – green or oolong tea can be added to a lidded Chinese cup, hot (but not boiling) water poured on, and when the leaves settle and/or open, it can be drunk – and topped up with more hot water for as long as the tea retains flavour. More modern mug infusers can also be used, allowing the tea to be strained and kept aside for further brewings, thus avoiding stewing the tea. At other times, when drinking a high quality tea, sitting with friends or relaxing at the end of the day, there is great pleasure to be found in making tea more elaborately - for example with repeated short infusions in a ceramic or clay teapot or a gaiwan (lidded bowl). This is where tea drinking can become a hobby, a ceremony and even an obsession. • Water should be freshly drawn (not water that has sat around in a kettle). Tap water should be filtered to remove any chlorine. Ideal water should be neither too hard nor too soft (i.e. containing more or less dissolved minerals). Spring water is ideal, although if it comes in plastic bottles it has a poor ecological imprint and may contain phthalates that have leached from the plastic. • Where temperatures of less than 100°C are required, the boiled water can be left to sit or cold water can be added. It is also possible to buy temperature-controlled kettles. However if the water can be watched as it heats, the traditional Chinese classification of bubble size can be used - shrimp eyes (70° to 80°), crab eyes (80° to 85°), fish eyes (85° to 90°), rope of pearls (90° to 95°) and raging torrent (100°). 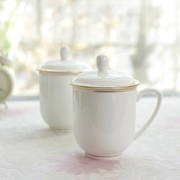 • Tea can be brewed in a large lidded cup, a small lidded cup (gaiwan), an infuser or a teapot. • The recommended temperature for each variety of tea will generally be stated on the packet if bought from a high quality supplier. 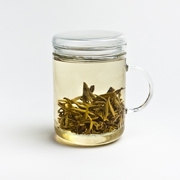 The more delicate the tea, the lower the water temperature (black teas can generally take high temperatures). 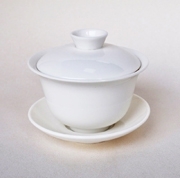 Since lower water temperatures may not be sufficient to cause the leaves to sink if made in a cup, these teas are best made in a teapot or gaiwan. • The recommended length of brewing is also likely to be given on packets of quality teas. For delicate teas such as jasmine pearls, or fine oolong and green tea – this is likely to be no more than two minutes (and ususally less on the first and second brewings), after which time all the tea should be drained from the leaves and drunk. A good tea can be re-brewed up to five or six times. Puerh is a robust tea that can be made with boiling water. Baked puerh is brewed longer than raw puerh, for example up to one minute for the first brewing, whereas raw puerh requires a quick infusion of only 15 seconds. It is then important to pour off all the tea from the pot or infuser so that it does not continue to brew. This process can be completed several times with the same leaves, always using 100 degree water (a thermos flask is invaluable), extending or adjusting the brewing period each time to taste, and noticing how the taste of the tea changes and develops with each infusion. The strength of the tea can vary with taste, but to appreciate the full, rich, earthy taste of baked puerh, the infusion should be fairly dark. For young raw puerh the liquor will be light and floral.